If you are not a Parsi or don’t have Parsi friends you’ve probably never heard of Udvada. 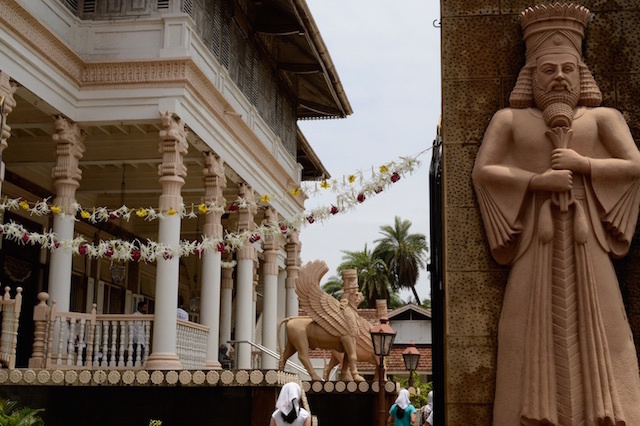 Located about 200 kms north of Mumbai this sleepy little town on the Gujarat border is renowned for its Zoroastrian Atash Behram, which is the most sacred of Zoroastrian fire temples in India and has a fire that has been burning continuously for more than 1250 years! Proud Parsi that I am, I like visiting Udvada for another reason completely – the food! This has to be the only town where you can feast like a king on all kinds of Parsi food without having to trek distances or waiting for that elusive Parsi wedding invite. While several trains departing from Mumbai can take you to Udvada, I recommend a road-trip as an early breakfast at Ahura is a worthy highway pit-stop. Located just after Charoti on the NH8, Ahura is the best way to start off your Parsi food extravaganza. While they also serve the traditional South Indian fare what you really want to order is their Salli per Eedu. Parsis’ the world over have a fascination with breaking an egg over just about anything and the Salli per Eedu made with fine potato sticks, egg and spiced tomato is an ideal way to start the day. 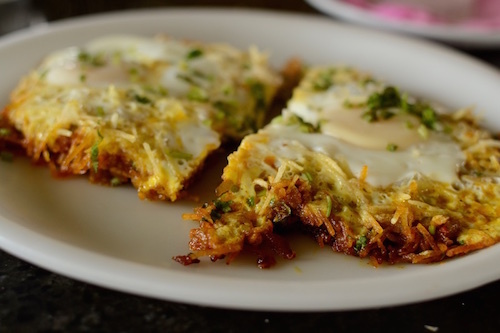 In true ‘bawa’ style, accompany the eggs with a hot cup of Parsi style ‘Fudina ni Choi’. Udvada is still about two hours away from Ahura so if you don’t binge, you will have space for the traditional Udvada Parsi breakfast of Aleti Paleti, Khurchan and Kheema Pav. While Kheema Pav is self-explanatory and a popular dish in many Irani cafes, you may not have tried the offal fiesta that is Aleti Paleti (a toss-up of chicken organs) or Khurchan (a mix of goat organs). Both these dishes cooked up with the unique Parsi style garam masala and served with freshly baked bread are a must try for those that love a meaty start to their day. 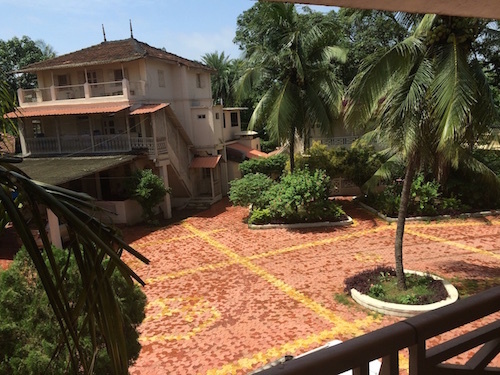 There aren’t many places to stay in Udvada and if you’re smart you will have booked into either Globe, Ashishvangh, J.J. Sanitorium or Sodawaterwala. 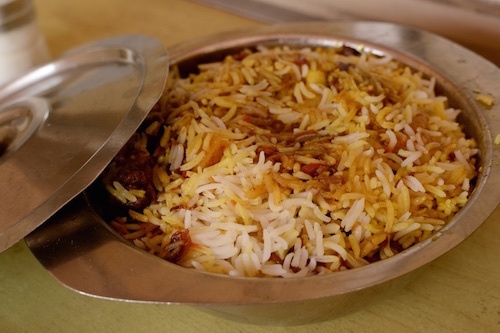 All of these serve up delicious Parsi food so there is no need for you to go food hunting. However, if you’re staying elsewhere, make sure you head to one of these places for a mid-day meal worth lusting after. While the menu’s change daily, if luck is in your favour you will get to try all three delicacies – the fried fish, some kind of kebab and pulao dar. Generally, the fried fish on offer will be the mullet, commonly called ‘Boi’ which comes marinated in turmeric and red chilli powder. Follow this up with a side of either Chicken Russian Pattice, Kheema Kebabs or Bheja na Cutlets and a tall chilled glass of Sunta Raspberry or Ice Cream Soda while you soak up some Vitamin D.
Don’t stop eating until you’ve had some Mutton Pulao Dar. The dal served with the Pulao is the same ‘Dhansak’ dal Parsis are known for and this meat laden dish is sure to send you off into a happy snooze – especially if you were smart enough to smuggle in some beer. While a siesta is important stay awake long enough for the distinct ‘tring-tring’ of the ice-cream guy that is sure to stop over at your hotel post lunch. I strongly believe that there is a different kind of pleasure to be had in digging into a small cup of seasonal hand-churned icecream made with fresh fruit and milk from the local cow. 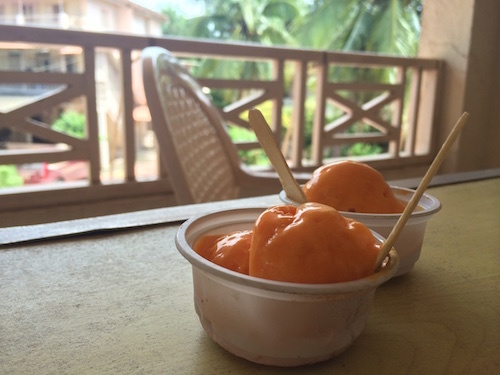 There aren’t that many flavor options and certainly no ‘toppings’ but the hand-churned goodness of the mango or sitaphal icecream more than makes up for this. 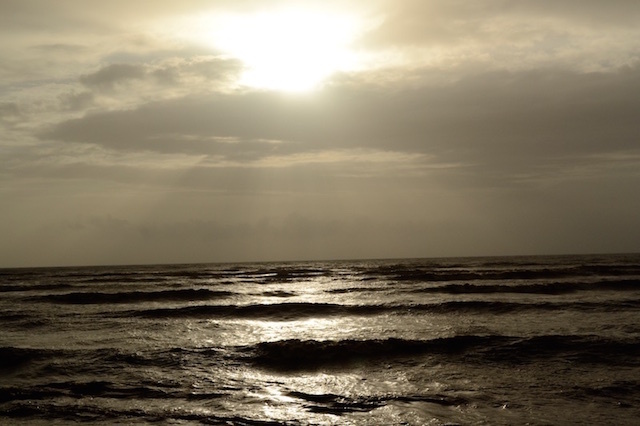 Most travellers only stop into Udvada for the day or for a single night. 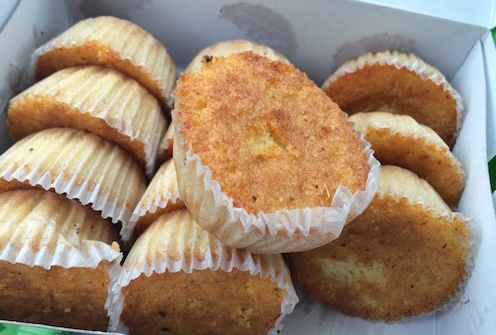 If you’re driving out early evening, make sure you stop by the Irani bakery on your way back from the beach to get your fill of Mawa Cakes, Batasa, and Khari. The Mawa Cakes they dish out here are the best ones I’ve had and I always bring back a giant box home to nurse my Udvada hangover. The jeera-studded ‘Batasa’ are a must buy if you like dunking biscuits into your tea or you can invest in the Khari which is made with the lightest of flaky pastry and oodles of salted butter. If you’re staying overnight, do try the Dudh na Puff early next morning. These Puff are the Parsi version of the Starbucks ‘Fluffy’ served to kids worldwide and is basically a glass of chilled milk froth topped with nutmeg and cardamom. While they can be made easily in your city fridge, the local vendors make the Puff by chilling the froth in an earthern pot overnight – a process I am convinced adds a unique taste to the Udvada Dudh na Puff. Finally, if you’re like me and don’t like to leave town without some food souvenirs make sure you pick up some mangoes, hand-rolled papads and pickle (preferably Kolah’s) to eat at home. So, the next time you are missing Parsi food, don’t wait for a wedding invite. Simply head to Udvada or order in from the Bawi Bride Kitchen ofcourse! Any Parsi caterer or home cook options you may aware about in surat ? Amit – I’ve only been to Surat once and sadly I didn’t get a chance to interact with many locals so can’t advise you of a home cook option. 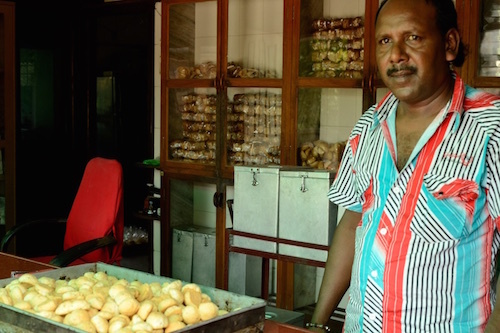 However, the Dotivala Bakery and their batasa’s are a must try! WOW! that really tempted me to go to Udvada. I was born in Mumbai and Lived around Parsi. Really miss parsi food. Are there any Vegetarian Vegan options available in this town. I don’t eat meat anymore. If I could get my hands on some veg Dhansak I would surely make the trip down to Udvada. Udvada, as we all know is a quaint little town and a second home for many. I have a place on Sarang Road, parallel to the highway, it is 2.5 acres of N.A. Land and we are looking to sell it. Kindly revert if anyone interested. Love love love Udwada. I miss it. don’t know if I will ever be able to go back. In early 2000s I went there every year for 3 years, for food, photography, sketching and reading. A wonderful place for all 4. I miss food the most. We usually stayed at Hector’s. Food and accommodation, all inclusive. So cheap, could never figure out, how someone could afford to feed people such amazing food at those prices! Miss it too much. PS: Great blog. I mean GREAT. Thanks to a couple of my Parsi friends, I savour parsi cuisine, and you described it all beautifully. Wow! I have lived in Mumbai for more than 15years but never knew of this place. Hidden gem indeed! ahura has been our regular pit stop when going to valsad..
Wow i would love to go to Udvada one day to try the mouth watering dishes. is the meat they serve Halal because i eat only halal meat. Thanks for the nice article.